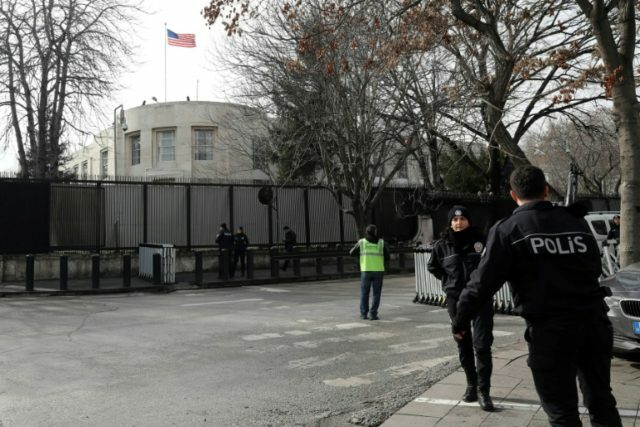 The U.S. Embassy in Turkey was closed on Monday due to a security threat, with a statement posted on the Internet warning American citizens to “keep a low profile” and avoid the embassy. Turkish authorities subsequently detained four Iraqi nationals suspected of ties to the Islamic State (ISIS). Turkish Deputy Prime Minister Bekir Bozdag said the U.S. embassy shared intelligence with Turkish authorities leading to “important results,” by which he presumably meant the four arrests made on Monday. Two of the suspects were en route to Ankara from the Black Sea city of Samsun when they were taken into custody. The other two were arrested in Samsun. The Ankara Chief Prosecutor’s Office said that a total of 12 suspected ISIS militants were detained in police operations on Monday and authorities continue to search for another eight individuals. All of the suspects were described as foreign nationals “in contact with people in conflict zones” and attempting to recruit operatives for the Islamic State. A suicide bomber attacked the U.S. embassy in Ankara in 2013, damaging the building and killing a security guard, as well as critically injuring a Turkish journalist who was on her way to meet with the American ambassador. The bomber reportedly panicked when a metal detector picked up his device and he detonated the weapon prematurely. The attack was blamed on a virulently anti-American Marxist group in Turkey.